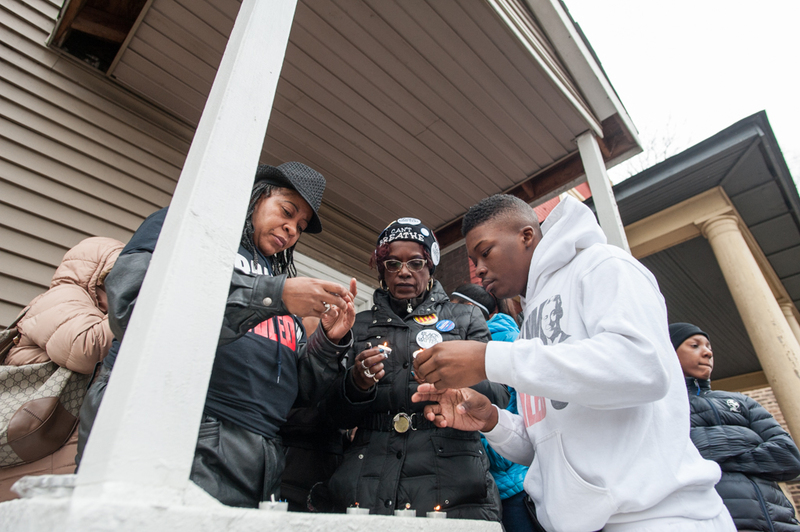 Janet Cooksey (left) lights a candle for her son, Quintonio LeGrier, and neighbor Bettie Jones who were shot and killed by a Chicago police officer on Dec. 26, 2015. A few days later, Mayor Rahm Emanuel announced changes at the Police Department, including the purchase of additional Tasers and training officers to use weapons other than guns. Chicago police officer Robert Rialmo was so traumatized after he killed Quintonio LeGrier and his neighbor Bettie Jones last December that Legrier’s estate should pay him $10 million. That’s according to a lawsuit filed by Rialmo’s lawyer in Cook County Circuit Court. The case might be a first, say some local and national legal experts. The lawsuit presents an unusual argument that attempts to make citizens pay for the hazards of policing. The morning of Dec. 26 Rialmo responded to a domestic disturbance call at an apartment in West Garfield Park. According to police, LeGrier, a 19-year-old college student, was combative. Rialmo shot and killed LeGrier and Jones, 55. Police say her death was an accident. Rialmo has been on desk duty since the shooting. LeGrier’s father, who had called 911 for help when his son became agitated, filed a wrongful death lawsuit days after the shooting. He accused Rialmo of shooting his son without just cause, using excessive force and failing to provide medical care as the teenager lay bleeding. On Friday, Rialmo countersued LeGrier’s estate, seeking at least $10 million. “Taking a human life is no small matter,” said Joel Brodsky, Rialmo’s attorney, adding that there is no ulterior motive for the lawsuit and that the case is strictly about the damages. According to the lawsuit, LeGrier swung a bat twice at Rialmo and ignored repeated orders to drop the weapon before the officer went for his gun and fired eight rounds at the teen. “Officer Rialmo feared that LeGrier would strike him in the head with the baseball bat so hard that it would kill him,” the lawsuit states. When he started firing his gun, Rialmo didn’t see Jones standing in the doorway behind LeGrier, where she was fatally struck. Johanna Schwartz, a leading national expert on police-related lawsuits, said the core arguments in Rialmo’s lawsuit make it “a real outlier.” She said being a police officer means being placed in threatening and difficult situations that could involve responding with deadly force. Schwartz said filing a workers compensation claim against the city, his employer, might make more sense. The Fraternal Order of Police, the union that represents Chicago police officers, did not return requests for comment; neither did lawyers for the LeGrier family. David Harris, a law professor at the University of Pittsburgh, said the lawsuit could be a misguided attempt to influence public perception and future litigation in the case. Where does criminal justice reform stand one year after Kim Foxx elected? The Cook County state’s attorney has taken steps towards some of her campaign pledges but lags in other key areas. If a guy swings a bat at you, you either counter with a baton or simply reach out your hand and take the bat away (yes, I have done exactly that). Shooting is in no way justifiable. the third thing you do is what rialmo did: get far enough away from the person swinging the bat so that he is no longer an immediate threat. assuming what the chicago PD says (always a questionable proposition) it was after rialmo evaded the danger that he decided to go rambo and start firing shots.